Taoiseach Leo Varadkar has said the internal political difficulties facing British Prime Minister Theresa May could not allow Ireland to soften its position on the backstop. Speaking in Helsinki, Mr Varadkar told RTÉ News: "The ball is very much in London's court. Internal British politics is really a matter for them. "I just hope Prime Minister May is in a position to get any potential agreement through her cabinet and through her parliament. "But we really have to stand by our objectives. The difficulties that happen in the United Kingdom can't allow us in any way to soften our position in my view." There is continuing speculation over whether or not the British cabinet can meet this week to reach a final agreement over the Irish backstop and the overall European Union withdrawal treaty. 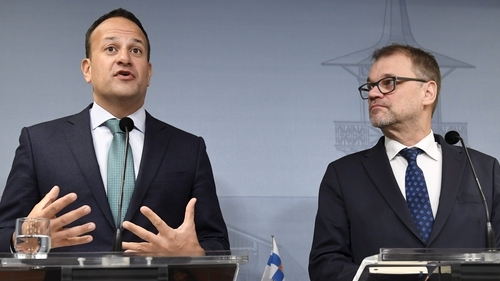 Mr Varadkar is in Helsinki attending the second day of the annual Congress of the European People's Party, the centre-right grouping of which Fine Gael is a member. The congress has voted for German MEP Manfred Weber to stand in the race to become European Commission President following next year's European Parliament elections. Mr Varadkar said Mr Weber had been very supportive of Irish interests and Irish concerns. "If he became commission president he would be a very good ally for Ireland," he said. Ahead of the last European elections, the European Parliament established the so-called Spitzenkandidat, or lead candidate approach to the elections. The idea was that the political group that won the most seats could then nominate its candidate to become the next European Commission President. Supporters of the idea said it gave more democratic legitimacy to the incoming president, while opponents said under the EU treaties it was the preserve of EU leaders to choose a Commission president. Last time around the EPP chose Jean-Claude Juncker at its congress in Dublin; this time around it was a contest between Mr Weber and Alexander Stubb, the former prime minister of Finland. While many EU leaders still oppose the Spitzenkandidat idea, including the French president Emanuel Macron, Mr Varadkar is in favour. Ireland's EU Commissioner Phil Hogan has told RTÉ News that if the UK does not come forward with new proposals on the backstop within days then it was unlikely any special summit would be called to conclude the Withdrawal Agreement in November. He said if he was a betting person, he would expect no breakthrough until the December European Council. "I think if we don't get proposals in the next few days it's unlikely we'll have a deal in November, so the pressure is on the UK to make those proposals. But I would say if I was a betting person we would have a December Council to discuss the final outcome. "But hopefully we can do a deal." Mr Hogan, who is also attending the EPP Congress in Helsinki, added: "There's been a lot of expectation generated by the United Kingdom government over the past week that we're about to have a deal but we haven't received any proposals from the prime minister yet, that indicate that we are close to a deal. "The issues are well known and we are waiting for the UK to make those proposals. "Mrs May has spelt out she has a problem with the backstop, the Taoiseach and the European Union have made it perfectly clear that there will be no change in the Joint Report from December 2017 and we now have to wait for proposals from the UK about how they can adapt their position to accommodate the agreement that they've already made in relation to the backstop on the island of Ireland." Mr Hogan said the European Commission was intensifying its preparations for a 'No Deal' scenario. "It's very prudent for the European Commission and all member states to plan for all eventualities. Nobody wants a situation where we don't reach an agreement, but our businesses and our sectors are anxious to know what the position will be in the event that there is no deal as well, so the Commission is working with member states to ensure that we are properly prepared for all eventualities."